Here's the NVIDIA designing ARM (low power mobile) chips announcement I was talking about today. A "full custom processor," designed by NVIDIA in partnership with ARM. World's first ARM processor targeted at high performance computing. NVIDIA really sprung this Project Denver as a major surprise at the end of its CES press conference here. This chip is "in development" and seems intent to conquer the desktop and laptop scene that is currently wholly owned by the x86 duo of AMD and Intel. It's true folks, NVIDIA's building a CPU! Madness! It's hard to properly express the gravity of a move like. ARM processors, as Jen-Hsun Huang just pointed out, are becoming the most ubiquitous around the world because of their great success on the mobile front. Taking them into the fortress of high performance computing is a daring decision, but if anyone has the requisite technical knowhow and OEM relationships to hit that ball out of the park, it's NVIDIA. For its part, Jen-Hsun's company is taking its antagonism with Intel to the next logical stage, finally announcing that it'll leap out of the GPU market and into the shark waters of CPU manufacturing. And oh yes, Microsoft just announced ARM compatibility for the next version of Windows. The future just got a lot more exciting. Update: The press release (available after the break) informs us that Project Denver will integrate graphics processing with straight computational skills in a fully integrated CPU / GPU hybrid package -- much like AMD's Fusion hardware -- and we've got a highly informative blog post from NVIDIA's Chief Scientist Bill Dally for you at the link below. 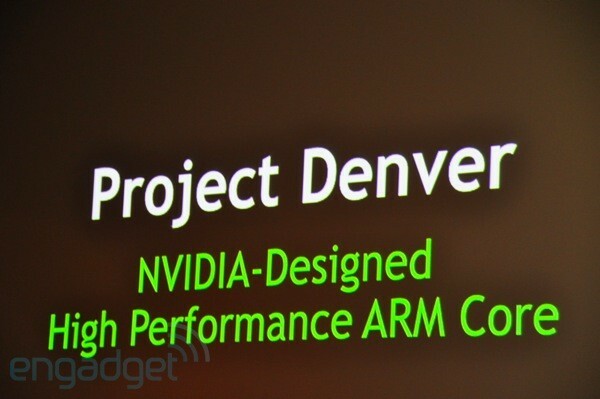 NVIDIA announces Project Denver ARM CPU for the desktop originally appeared on Engadget on Wed, 05 Jan 2011 16:01:00 EDT. Please see our terms for use of feeds.